Welcome to Sweet Serenity Mountain in Pigeon Forge! 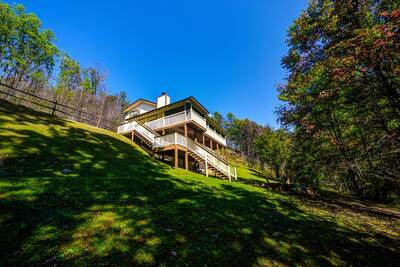 This 3 bedroom Smoky Mountain cabin rental greets you with a view of Pigeon Forge including the city lights of downtown and the wheel at The Island. 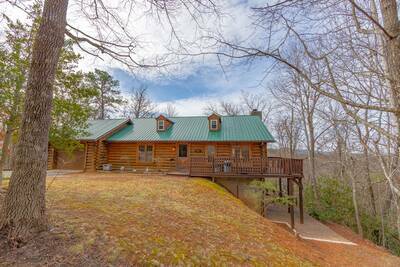 You’ll love the flowing floor plan and spectacular amenities this cabin offers. The majestic living room is complete with a massive mountain stone fireplace, flat screen TV, picture windows that frame the views and covered deck access. 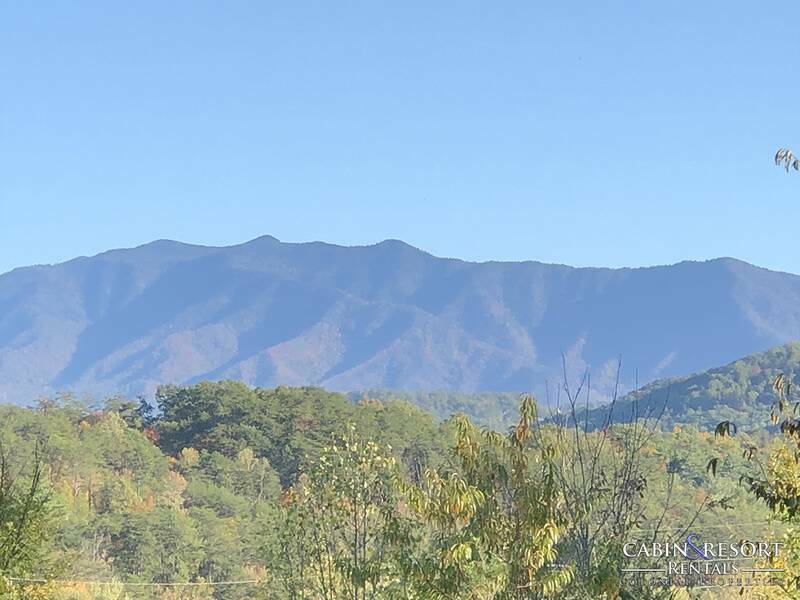 The fully equipped kitchen is the perfect place to cook a delicious breakfast to get your day started in the Smokies, a picnic lunch to enjoy on the deck or a wonderful dinner that everyone will love and enjoy. There’s a nearby dining area that seats up to 6 people comfortably. Sweet Serenity Mountain offers a main level king suite bedroom with custom crafted bed and access to a full bath for additional privacy. Take a walk upstairs and you’ll enter the second level loft living area with cozy seating, TV and access onto a covered deck where you’ll find rocking chairs and a porch swing. The master suite is located on the second level and provides you with one of the most beautiful spaces we have ever seen. 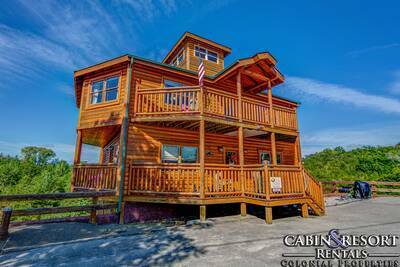 You’ll fall in love with the soaring cathedral ceiling with exposed beams, flat screen TV, fireplace, sitting area and a two person jetted tub overlooking Pigeon Forge with deck access nearby. Head down to the lower level at Sweet Serenity Mountain and you’ll find the huge game room that is surrounded by windows that frame the beautiful views. 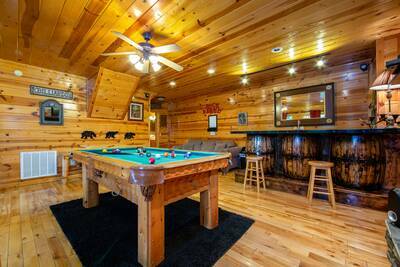 The game room offers you and your guests a pool table, fireplace, flat screen TV, a futon that’s perfect for naps or lounging and even a card table to enjoy. Located on this level you’ll also find a full bath and the third bedroom that has a queen bed and TV. The main level covered deck at this Pigeon Forge log cabin getaway offers the same amazing views you’ll find throughout plus a patio table, BBQ grill and a bubbling outdoor hot tub. Sweet Serenity Mountain provides you and your guests with complimentary wifi internet so that you can browse the web while vacation in the Smoky Mountains. You’ll also have season outdoor swimming pool access in the warmer months, so be sure to pack along your bathing suit and sunscreen. With its prime location, easy access, fantastic views, countless amenities and spacious floor plan, you and your guests will love everything this beautiful cabin has to offer! Reserve your vacation stay today! A: Yes! It does have a pool table. A: Hi Laura! Approximately 5 minutes from Pigeon Forge and unfortunately this is not a pet friendly property. A: Sweet Serenity Mountain does not have sleeper sofas. There are 3 bedrooms, 2 with King beds and 1 with a Queen bed. A: Hi Chris! Yes, it has mountain and city views. “ Beautiful cabin that was decorated so pretty with bears. The cabin is very close to the Parkway which was so nice and convenient. Look forward to using Colonial Properties again!